This tutorial provides a simple walk-through of most of the features of Taurus FamilyTree, using the example data file example.xml. You should now be looking at a window containing three panes, the tree-view, the table-view and the document view. The tree-view is used to display hierarchies of people, and a person may be selected for closer examinatiom by clicking on the tree. The gender of a person is shown using the conventional male and female symbols. The letter codes are F for father, M for mother, HW for husband/wife and S for sibling. The table-view shows information about the selected person, their date of birth, their age etc. It also shows their parents, spouses, siblings, uncles, aunts, and cousins. The document-view is used to display descriptive text and pictures for an individual. Documents can also contain hyperlinks (shown as blue underlined text). Initally, "Example Me" should be selected and displayed in both the table- and document-views. Now click on "Example Daddy" in the tree-view. The table-view will be updated to reflect "Example Daddy"s relations and the document-view will display the document for "Example Daddy". Note that you can explore the tree further by clicking on the "+" symbols to expand parts of the tree. Now we will use the table-view to navigate to "Example Grandad". Simply click on "Example Grandad" (the second row down) and the document-view will show the document for "Example Grandad". Finally, we can use hyperlinks to navigate between documents. Simply click on the blue "Great-Grandad Example" link in "Example Grandad"s document. You should see "Example Great-Grandad"s document in the document-view. We can also navigate backwards between hyperlinks in the document-view by right-clicking and selecting Back from the menu. Each person can have additional information about their birth, christening, marriage and death associated with them, not just the single document we have seen so far. Right-click on the person's node in tree-view and select Birth, Christening, Marriage or Death. 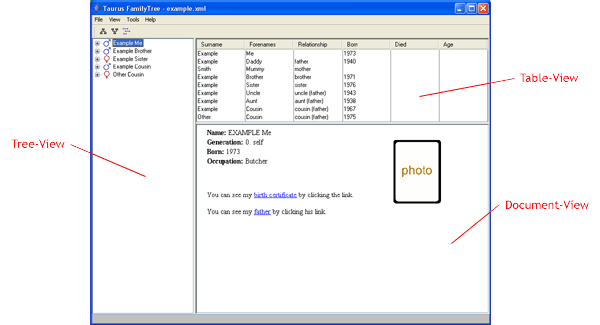 Select "Example Me" using the tree-view. You should see that the document contains a blue underlined hyperlink to "birth certificate". If you click on this you should, after a short delay, see a scanned image of "Example Me"s birth certificate. Now we will use the pull-right menu to display "Example Daddy"s marriage certificate. Simply right-click on "Example Daddy" in the tree-view and select Marriage from the resulting menu. Note that the Birth, Christening and Death entries are only shown if that information is available. Description is always available and takes you to the document for that person - just like clicking on the node itself. The root of the tree-view is not fixed - you can change it to any one of the bottom-most children of the tree. This allows you to explore the tree from the perspective of different families. For example we might want to explore the "Other" branch of the "Example" family. To do this, bring up the View menu, go to Set Root, and select "OTHER Cousin". The tree-view will be updated to show "Other Cousin" as the root of the tree. If you explore the tree, you should be able to see that "Example Aunt" is a sibling of "Example Daddy". The orientation of the tree-view can also be changed - this is a bit like switching between ancestors (child-first or "inverted") and descendants (parent-first or "normal") diagrams. To do change the orientation, bring up the View menu, go to Orientation and select Normal. You should now see that "Example Great-Grandad" becomes the root of the tree and that the nodes the children of "Example Great-Grandad". Figure 10: Tree Diagram using "Set Root"
Figure 11: Ancestor Diagram using "Set Root"
That concludes our session on using FamilyTree. The next step is for you to start entering your own data. To do this, you can start by reading through example.xml. There is a complete online reference to FTML online on the Taurus homepage.